Former Alaska Gov. 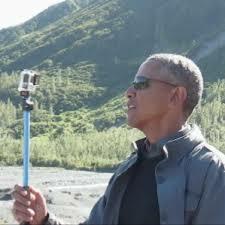 Sarah Palin said Sunday that President Obama should have carried a “big stick instead of a selfie stick” during his visit to her state last week amid recent reports of Chinese and Russian aggression. Five Chinese warships sailed into U.S. territorial waters in the Bering Sea near Alaska during the president’s visit last week to promote his climate-change agenda, while Russian bombers were intercepted July 4 off the coasts of Alaska and California.